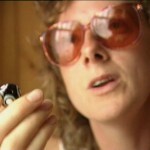 Jame Jar, produced by Charlie Stuart for UK’s Channel 4 TV in association with Fresh Film UK and directed by Simon Everson, Jam Jar was filmed in Wales in 1995 about author, Donna Williams. Bestselling author Donna Williams lives on a farm in rural Wales with her first husband, a man on the autistic spectrum. Here they live according to a different culture and rules that are taken for granted in the world beyond their own. Donna becomes a tour guide showing us the person beyond the labels on the ‘jam jar’. Poetic and artistic, Jam Jar explores Donna’s meaning deafness, meaning blindness in the context of autism and the social, emotional and communication bridges she uses to navigate with the world. But there was a richer story behind the story. The original script for Jam Jar was presented to Donna before filming. The storyline for it was focused on ‘autistic marriage’. She declined the outline for the documentary and presented her own, a tour guide of her world at the time. Simon Everson came on board as director and appointed a technician who had been involved in a previous documentary made of her so she would feel at ease with the six week shoot. With two person crew, Donna accepted the filming and the crew arrived in rural Wales. During the shoot, Donna’s father, who had battled cancer, found that at the age of 59 he had two weeks to live. Filming happened amidst Donna’s long distance calls to her father in hospital in Australia. He died two weeks before the end of filming and it was the crew who helped her come to terms with her loss. The two person crew halted filming and helped her through these events but more was to come. Within ten days of her father’s death and on the eve of her second wedding anniversary, her first husband, featured in this documentary, then announced he was leaving. The crew were in shock but at Donna’s request continued to complete the documentary as her husband packed up the furniture around them and moved out. 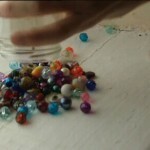 The opening footage of Donna spinning beads in a window was taken in their now emptied bedroom. Jam Jar not only went on to be nominated for the Mental Health Media Award, it became captured in the book, Everyday Heaven in which we get behind the scenes and eventually become introduced to her second husband, Chris Samuel with whom she went on to spend 17 wonderful years of marriage until the end of her life in 2017. In Dec 2016 after her diagnosis with metastatic breast cancer, Donna made a feature length documentary, Nobody Nowhere, with Gavin Halpin from Paper Owl Films and Andrew Brenner from Nondescript, currently in pre-production. Donna Williams, Dip Ed, BA Hons.